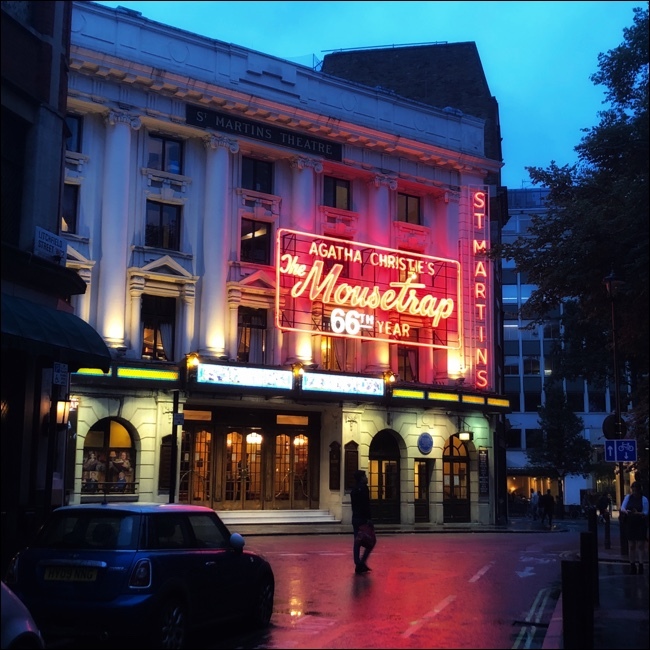 Herewith an account of the adventures in England in 2018, written on the spot with scant reworking. The events depicted took place last wee4 ago. I do not understand people who sit by an outlet at the airport and use their phone WITHOUT PLUGGING IN. Before a nine-hour flight, no less. I don’t even think the word “phone” in an airport unless I’ve plugged it in, and I have batteries galore as well. After dinner now. It was good! I mean, hurrah surprise, it was good. The bun was not entirely made of sawdust, and the whipped butter was like “a dream of vague happiness butter might have, if it dreamed” but the chicken was without question the most easily-sliced meat I’ve had a on plane in a long time. There was a cheese plate, with grapes, and a brownie. The dessert was chosen for its charity work, I think; the package said “Eat a Brownie / Change a Life” and I don’t think that’s how it works. A number of people eating brownies made by a company that could divert some profits to an organization that has a proven track record of altering lives, yes. But there’s no one-brownie : one life deal here. As noted, I am in A20, which is a Comfort Plus seat. We get free drinks. I’m sitting next to a doctor or researcher; I snuck a peak at the scholarly paper he was reading, and it concerned Dengue Fever. (It’s bad.) Apparently he has a lot of miles - almost 3 million - because the steward was fawning all over him, telling him how much they appreciated his business - here’s a card that will help you get through customs faster! And so on. Always by name. Your Wine, Mr. Doctormiles. Your drink, Mr. Doctormiles. Your dinner, Mr. Doctormiles. At which point I said to the stew, with mock offense, “You know, I have a name too. Just because I don’t have three million miles doesn’t mean I don’t have a name.” The steward was stunned, but he’s good; he’s got the best patter of anyone I’ve seen in the business, and uses his Richard Deacon vibe to make everything think they’re at a Mad Men party. “Well I’m Paul,” he said, sticking out his hand, and I took it and said “I’m James,” and that was that. It was a bit! At 30,000 feet. I should just shut up. So where are we going this time? We aren’t. I am going back to Walbers. To the Anchor. Alone. From Three to Two to One. Next year, three - I hope. But for now, something I planned when I knew Gnat would be leaving in early August. Dear Wife is going on a trip with her mother in September, so we agreed to separate vacations this year. Every moment on this plane defines the furthest all of us have ever been from each other. Oh, about the plugs and chargers and batteries? I have outlets at my seat for computer and USB. Just about to leave the continent for a flight across the drink, and I’ve power and internet. All is black outside the window; listening to the Paul Whiteman. One more glass of wine and I’m out of here. I think I got two and a half hours. Now I’m wide awake because it’s light out. The steward, Paul, is handing out breakfast. And how do I know his name? When he came by to hand out coffee he asked if MR. LILEKS would like any, and I had to grin: he’d checked the manifest. “Are you by any chance the same James Lileks who writes for the Star Tribune?” He said, and I said that I was, and said oh so after that little outburst you went to see how that loudmouth was, and he said why yes, then joked no of course not. Serves me right. But we’re fast friends now. Okay, it’s time for a muffin. LATER. Landed, stood in line in Passport Control for quite a while, wavering with exhaustion. Went through the context exam where you have to state why you’re here, and I always feel guilty. Like they’re going to catch me at something. I’m also here to do a play! Ah, sir, are you getting paid? No, it’s a fundraiser. Is money involved? Yes. Sorry, your visa does not permit it. you'll have to leave. From some stories I’ve heard things like that can get you turned away. Okay, one story on Medium three years ago, but still. 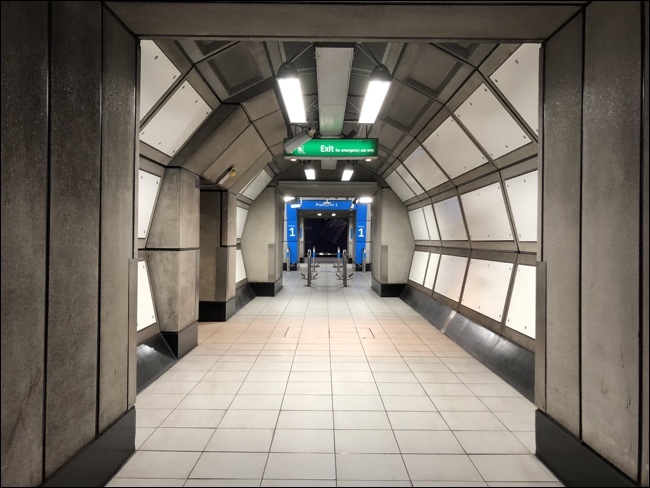 Okay get bag, then find the Heathrow Express - it’s down in the bowels of the train connections, which are not the best part of Heathrow. Not well marked, although I want signs every 10 yards. YES THIS IS STILL THE CORRECT WAY. A brief fast trip . . . then Paddington Station. mere 50 minute walk on a beautiful day! Ten minutes later! I’m dying! Twenty minutes later I’m down in the tube with a recharged Oyster card. I used to have subway anxiety - I’ll go the wrong way, get lost, get trapped, etc. The old anxiety. Now: eh. 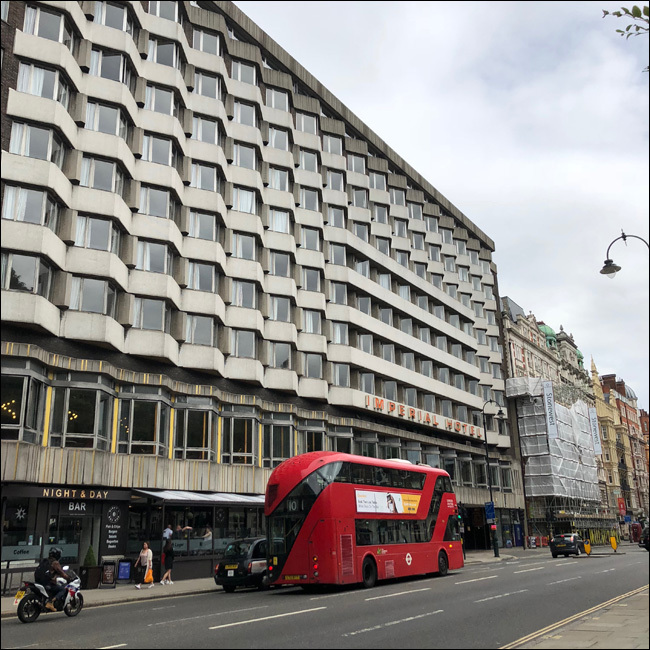 Straight shot on the Central Line, a brief walk to the Radisson Blu Edwardian Mercer on Seven Dials. 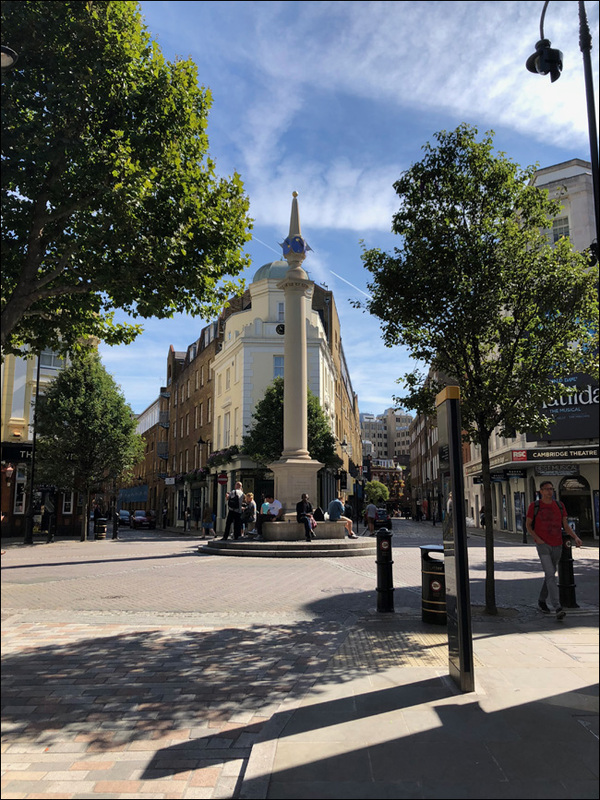 Seven Dials was originally laid out by Thomas Neale, MP in the early 1690s, who cleverly laid out the area in a series of triangles to maximise the number of houses as rentals were charged per foot of frontage and not per square foot of interiors. Neale aimed to establish Seven Dials as the most fashionable address in London, following in the footsteps of the successful Covent Garden Piazza development earlier that century. Unfortunately, the area failed to establish itself as Neale hoped and deteriorated into a slum, renowned for its gin shops. At one point each of the seven apexes facing the Monument housed a pub, their cellars and vaults connected in the basement providing handy escape routes should the need arise. There was a bawdy drunk sitting on the base of the Monument tonight, shouting at the revelers. A spirit of the previous era, banished since the area gentrified in the 1880s. The Monument, by the way, is not the original. Recent research suggests it was deliberately removed by the Paving Commissioners in an attempt to rid the area of “undesirables". The one that stands today, that looks like such an old piece of London, went up in 1988. By the way: my hotel is on Mercer Street. This is the sort of thing that surprises Americans, because we have no idea. 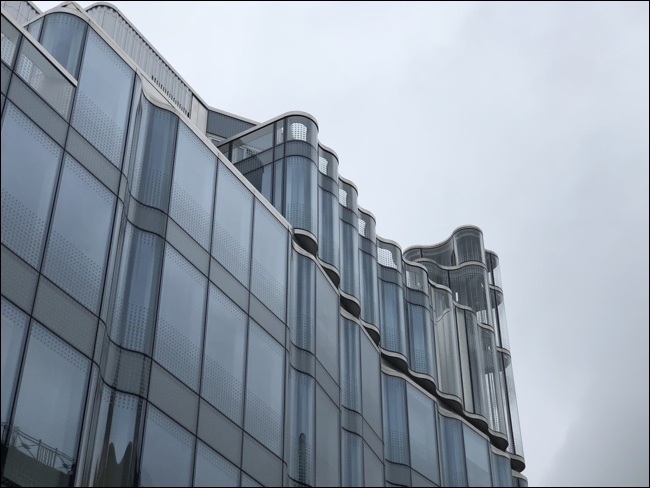 The Worshipful Company of Mercers is the premier Livery Company of the City of London and ranks first in the order of precedence of the Companies. It is the first of the Great Twelve City Livery Companies. Although of even older origin, the Company was incorporated under a Royal Charter in 1394, the Company's earliest extant Charter. The Company's aim was to act as a trade association for general merchants, and especially for exporters of wool and importers of velvet, silk and other luxurious fabrics (mercers). By the 16th century many members of the Company had lost any connection with the original trade. Today, the Company exists primarily as a charitable institution, supporting a variety of causes. Ah, but as we'll see . . . this isn't the whole story of Seven Dials. Later: tales of murder and transportation! So I walked a bit to tire myself out, then had a deep confusing nap. Woke and went over to Cafe Nero - yes okay it’s a chain, but it’s damned good coffee. Read the FT - there’s something different about sitting down with newspapers in London as opposed to New York. Perhaps it’s because I’m used to the NYT and the WSJ, but they’re just so BIG here and hefty and full of things to read. Then the big walk for lunch and pictures and perhaps a museum. 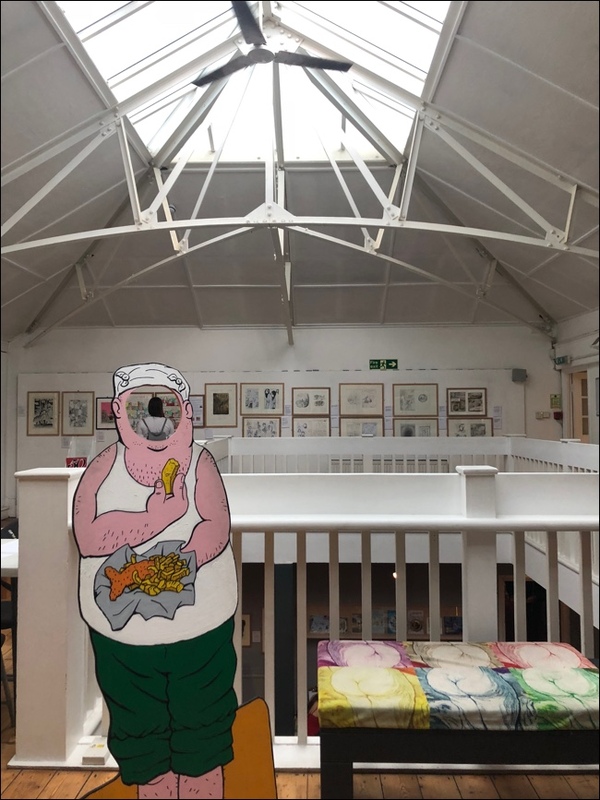 Ah: the Cartoon Museum. It’s . . .underwhelming. I mean, I’m glad it’s there, and when they have more space the collection will be more interesting, but I found myself less interested in the cartoons on the wall than I would have been if they were in the paper. Context helps; the chatter and chaff of the rest of the page gives it a place in its time. On the wall, cut out from its medium, they seemed less compelling. 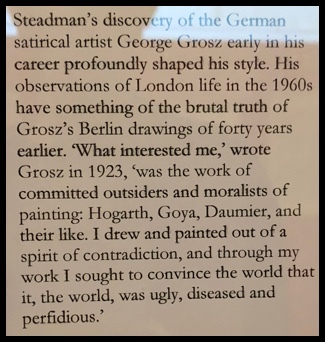 A remark from Ralph Steadman. Hey, pal: up you should lighten. One of the things I enjoy about London? The bad architecture has a particular appeal. They specialized in that slanted-window style, as if they hated the uniform streetline with such passion they wanted to dynamite the accumulated aesthetic whenever possible. It could have been saved and reused, but they weren’t in the saving mood. Found a fish & chips place that looked battered - sorry - and old and hence authentic. The chairs creaked and the tables wobbled. Sat by the door and watched the world go by. It was perfect. That was my first day in London. Tomorrow, the dreaded Museum Blog Entry, but I hope I’ll find something interesting. I’m not just going to post pictures and say ME LIKE ART, ME SMART. The modern buildings, in general, I like. Oh bloody hell, they're still coming to see this thing, we'll have to get out the seven again and hope it lights. 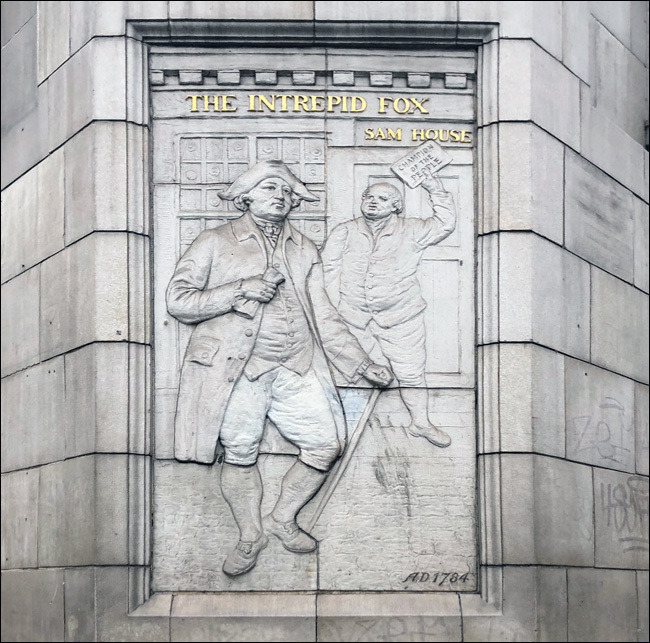 The Intrepid Fox was a pub at 97/99 Wardour Street, Soho, established in 1784 by the publican Samuel House, who named it after the prominent British Whig statesman Charles James Fox. 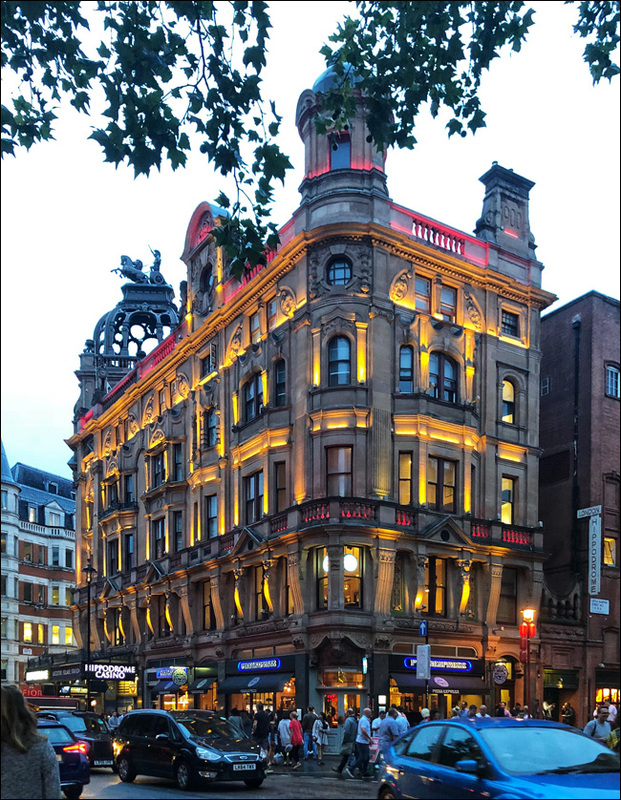 The pub was located on the corner of Wardour Street and Peter Street. During the general election of 1784, House provided free drink to the public. More recently, it was a goth pub which also hosted heavy metal gigs. It closed in 2006, when the owners sold the building to property developers. First day done. Drink. Sleep. See you tomorrow.